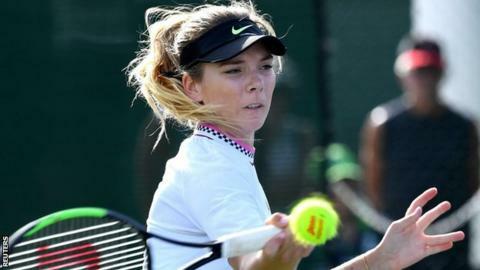 British number two Katie Boulter is one win away from the Indian Wells main draw after beating American Allie Kiick in qualifying. Boulter, 22, won 7-5 5-7 6-2 in two hours and 19 minutes. The world number 85, who is seeded sixth, will face Switzerland's Viktorija Golubic in the second qualifying round on Tuesday. British number three Heather Watson, 26, lost 6-2 6-7 (3-7) 6-4 to Italy's Sara Errani. World number 113 Watson, whose only two wins this year came in Hobart qualifying in January, saved three match points in the second set and led 4-2 in the last. But she lost four games in a row as 2012 French Open finalist Errani sealed victory in two hours and 34 minutes. British number one Johanna Konta - ranked 45th in the world - has direct entry into the draw and will face France's world number 54 Pauline Parmentier in the first round on Wednesday.